Today I have an interview with David Bain, horror author of the novel Gray Lake and dozens of short stories. 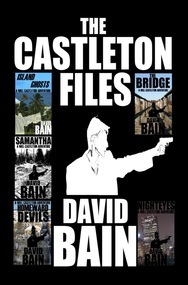 Some of those stories have featured a character named Will Castleton and Dave's new novel, Death Sight, is the first full-length Castleton adventure. But he can tell you more about that than I can. Dave, can you tell us a bit about your new novel, Death Sight? Death Sight is the first novel in the Will Castleton series. There are already several stories and a novella, collected in The Castleton Files, available in print and all ebook formats. While The Castleton Files feature stories from throughout Will’s career, Death Sight is his origin story, detailing the devastating events which presage and lead to his “slightly psychic” abilities, then chronicling his initial, furtive, reluctant acceptance of said abilities. It’s also, to some extent, a novel about the changes one goes through in one’s early twenties. It can be a lonely, difficult period, full of uncomfortable transitions - at least it was for me - and it certainly is for Will. Readers will decide, but my feeling is I really put him through the wringer. Here’s the “back cover blurb” for Death Sight: Hospitalized after drowning during a rescue attempt, newly graduated U.S. Marshal Will Castleton is besieged by visions of a hulking executioner torturing a bound man. A perilous race against time leaves Will broken, unsure if he even wants to join the marshals. Escaping to his Michigan hometown, Will finds his father dying, a young woman’s ghost desperate to communicate with him, and a biker kingpin out to make a statement by taking out local law enforcement’s golden boy. You've written quite a few Will Castleton stories. Do you plan on many more short stories and full-length novels featuring the character? Always! Sooner rather than later I’ll put out a ghost story collection called Ghosts, Just Behind You, featuring “Purgatory,” a new Will Castleton story - maybe a short story, maybe a novella - either way it’s harrowing, with Will getting kidnapped by some badasses and a couple ghosts help him escape. What drew you to genre fiction, particularly horror? I seem to have a different answer to this question every time it’s asked. Tonight (as I sit alone in a Mexican restaurant, two tall beers in) I think it was about rebellion. Horror was the most contentious fiction I could find at the age when I needed something rough, independent, socially questionable to cling to. I wasn’t a Goth or a hair band disciple - I was, in fact, a rather tender and tenuous adherent to almost every one of the various late ‘80s ethics, exploring broadly - I listened to The Smiths and The Cure in secret, after the Guns n’ Roses and Metallica crowd had left the party. Stephen King and Clive Barker were pretty much all I was interested in. It was the only fiction that spoke to me, period. I got in a lot of trouble before I was sent to college - the university environment pretty much saved my life, gave me the focus, inspiration and direction I needed. And it was there that I discovered enough diverse horror/mystery/fantasy/science fiction writers, from Poe to Chandler, from Tom Robbins to Octavia Butler, to show me there was a hell of a lot more than mere rebellion going on. Can you tell us a bit about A/A Productions and the projects you currently have underway? A/A Productions is a small publishing company I’ve started. So far we’ve published Proactive Contrition, a 100,000-word experimental “meta-memoir” by Chicago writer Wayne Allen Sallee, a several-time Stoker nominee, a collection of stories by Ken Goldman, an author who’s appeared in about every small press horror publication imaginable, and a handful of fun anthologies such as Dark Highways, Sword and Zombie, Forbidden Texts and Dark Days, featuring great authors like William Meikle, Jon F. Merz, Scott Nicholson, Mike Arnzen, Steve Vernon, Eric S. Brown and lots of others. I make no bones about the fact that A/A Productions uses the same self-publishing venues and tools available to any author these days. On one level, we’re simply a middle-man, providing art, editing, formatting, etc. I also make no bones about the fact that authors could be doing all this for themselves. But some authors are technologically challenged or simply don’t want to be hassled with it. Another part of the idea is to be selective about projects, setting a certain standard - yes, authors could easily be self-publishing this work, but the goal is to form a sort of collective where people will know an A/A Productions book will have quality content, quality formatting, quality editing, etc. I’m going for a very indie feel, with the authors having a say and creative control at every level. Right now, I don’t charge an up-front fee; instead, I receive a share of the profits of each book - usually 15%, like an agent might - this way I keep a vested interest in each project. It keeps me doing the best work I can and pushing as hard as possible to make each one a success. What will you be working on 2013? The major item on the docket is Green River Blues, the second Will Castleton novel. That’s my top writing priority. There are a number of other projects which may or may not see fruition. I’m also likely to finish a novel called The Care and Feeding of Michael Anthony Zee - it’s about 80 percent done and much more mainstream, literary and crazy than most of my other work, sort of a hipster angle on the sort of thing I normally do. Right now my web site says I’ll be self-publishing it, but I’m seriously considering seeking a traditional publisher for it. We shall see. There are also too many stories, novellas, anthologies and the like in the works to list here - the best bet would be for interested readers to follow my blog or Twitter, which is where the real fun is. But I do want to mention this! 2013 should also see a Wattpad exclusive work aimed at young adult readers - at least novella length, maybe a novel - called Stalk Me. I’ve started serializing some work on Wattpad, and I’ve received some praise but also a little flak for it - why fer crysakes would an established writer play around on a site populated by Twilight imitations and One Direction fanfics!?!?!? Yes, you do have that sort of thing on Wattpad, but you also have surprisingly creative and adept writers (young and old) sharing stories that are, in truth, more read, more discussed and more loved than the bulk of self-published work on Amazon. Wattpad is totally about story. There’s no thought of money, just entertainment and community. I’m simply floored at the quality of stuff you can find there, and I love the spirit of freedom, interaction, fun and creativity. Thanks, Mike, for the chance to do this interview! You rock and everyone should buy Sullivan’s War! Thank you, Dave! I keep telling people that, but they just laugh and walk away. Click here for links to purchase the new novel Death Sight on Amazon (Kindle), B&N (Nook), Kobo and Smashwords.